The main stage sound comes from eight Laney straight fronted 4 x 12″ speaker cabinets. These cabinets are mounted in four steel frames. 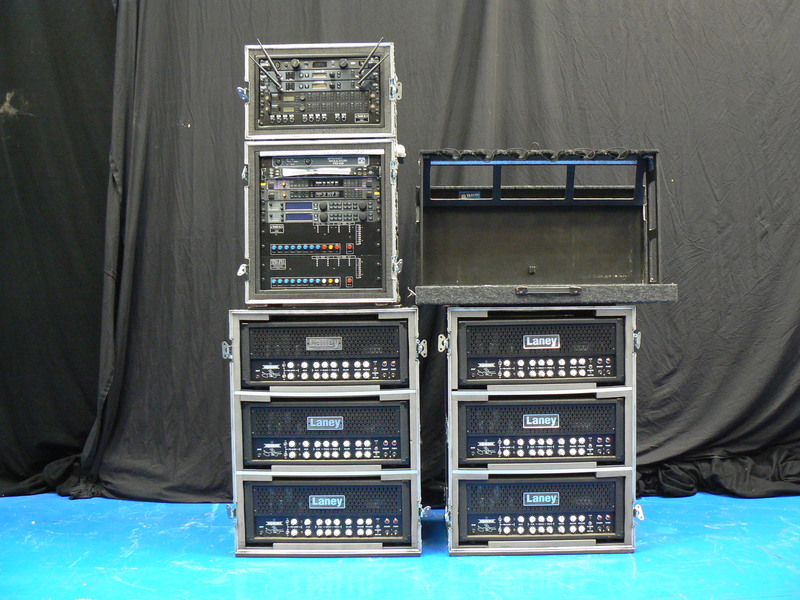 The cabs are loaded with Celestion G12H loudspeakers. The cabs have been modified to take Neutrik Speakon connectors in parallel with 1/4″ jacks. There are also eight 2 x 12″ wedges custom made by Laney distributed around the stage powered from within the guitar set-up. Along with a pair of earlier made but similar wedges for the drums, these serve as guitar monitors for Tony and the rest of the band to ‘lock on’ to a pure guitar sound as they move around the stage. 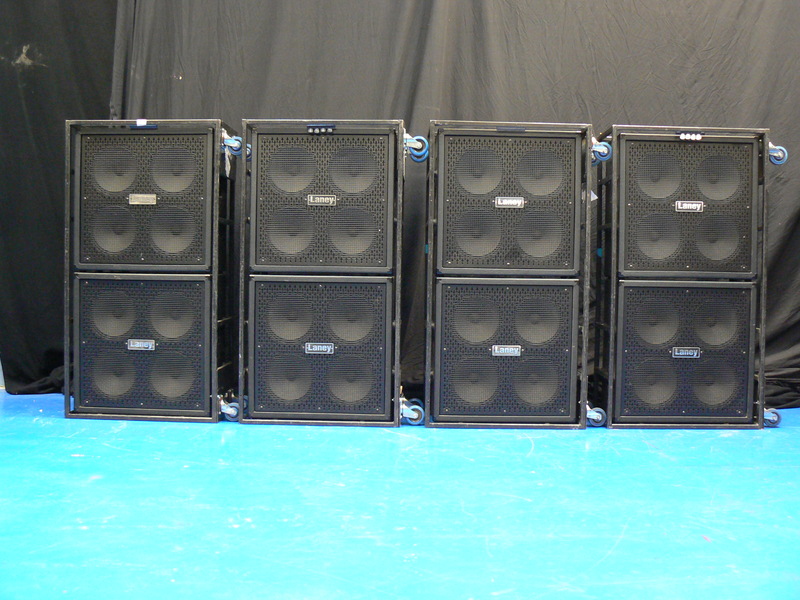 These wedges are loaded with Celestion G12 75T loudspeakers. 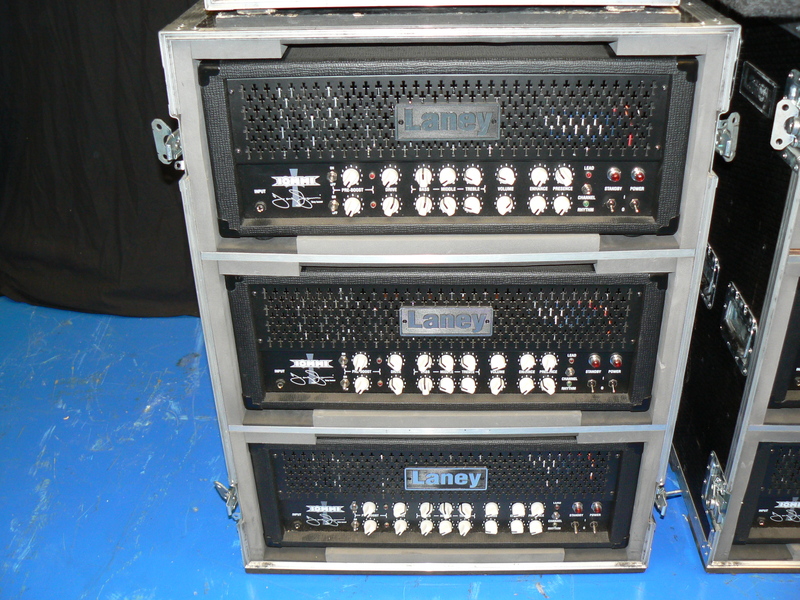 Each of the 4 x 12″ cabs is driven by one of eight Laney GH 100 TI amplifiers. These are the Tony Iommi signature models. (See elsewhere on the website for the history). The GH 100 TI is an all valve (tube) 100 watt amplifier head. The amplifier is designed in such a way that the power amp section can be used independently of its pre-amp section. One of the heads is designated the master head and its pre-amp drives all eight heads as slave power amplifiers. See below for how this is configured. The output tubes used are the TAD EL 34STR, which have proved to be the best of all tested. All of the monitor wedge speakers are powered by HH V800 power amplifiers, driven via an HH EQ 125 graphic equaliser, from one of the output sections of the Pete Cornish control rack. At the heart of the system is a custom built signal routing and control unit from Pete Cornish. At the front end, the guitar plugs in. At the back end, the final guitar signal is fed out to all the power amps. The guitar signal input can be switched between cable and radio sources. If a wireless system currently used, is the Shure ULX P. After many years of using cables, this is the only unit that Tony has felt happy with. After the guitar input there are A/B switches for guitar swapping. Then there are 4 in-line relay switched effect send & return loops. Following them are 4 side-chain relay switched effect send & return loops. Following them are another 2 in-line effect send & return loops. Following them are the mute switch, dry mute switch and output boost controls for the various outputs that the Pete Cornish device has. The first three in-line loops enable a wah, a compressor and an octave divider. Currently, these devices are a Tycobrahe Parapedal wah, a Drawmer LX20 compressor and either the Boss or Digitech stomp box octave dividers. The fourth loop is the pre-amplifier of the master amp head. The send from the routing rack goes into the front high input of the head, and the return comes from the effects send of the head. The dry signal then continues through the unit with portions being tapped off for, and mixed back in from, the 4 side-chain effect loops. These are a short slap-back delay from a Korg SDD 1000, a longer delay from another Korg SDD 1000, a chorus from a Korg DL 8000 R multi-tap delay and a combination of effects as required from a Peavey Addverb III. Next are two more in-line loops enabling a graphic equaliser and a Rocktron Guitar Silencer unit. All the signal cabling within the routing system is run as balanced line resulting in a significant drop of background noise compared to the previous system, it is not usually necessary to switch the Guitar Silencer in line. 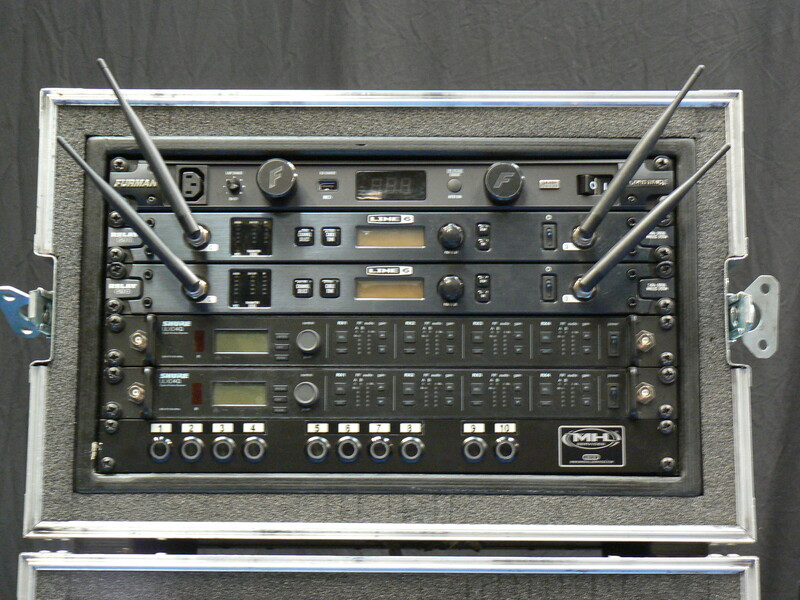 The graphic EQ in the system is an MXR stereo 15 band rack mount model, used in mono. This is the final unit before the output section that sends the signal to all the power amps. The purpose of this final unit is to iron out the differences in sound on stage due to the differing auditoria that Sabbath perform in. After these devices the signal is fed to the power amp sections of all eight GH 100 TI amp heads for the main 4 x 12″s and a series of HH V 800 stereo power amps for the wedge monitors. 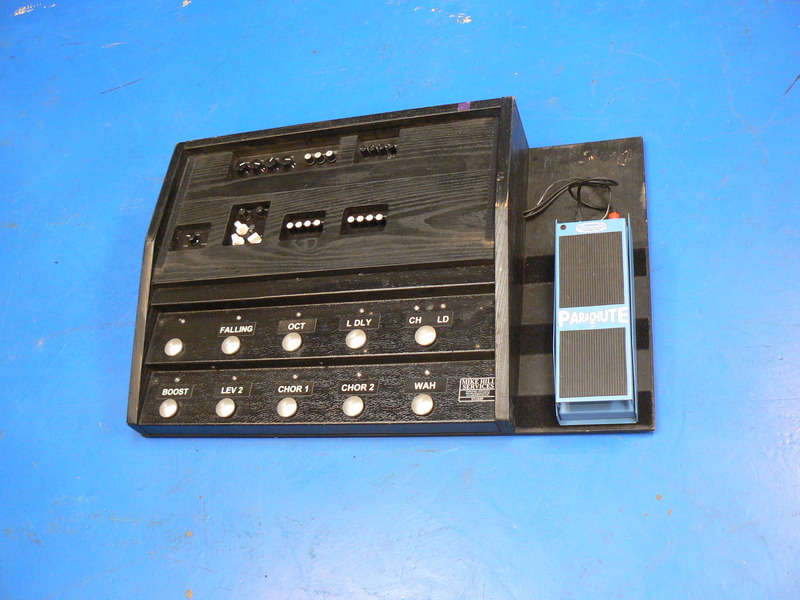 There is a remote Pete Cornish foot pedal board that houses parallel control of most of the effects loops and also the Tycobrahe Parapedal wah. All cables in the guitar rig are custom made by Mike Clement of M.C. Electrics. E-mail address: mikeclem@gmail.com. Custom cables are built to order. 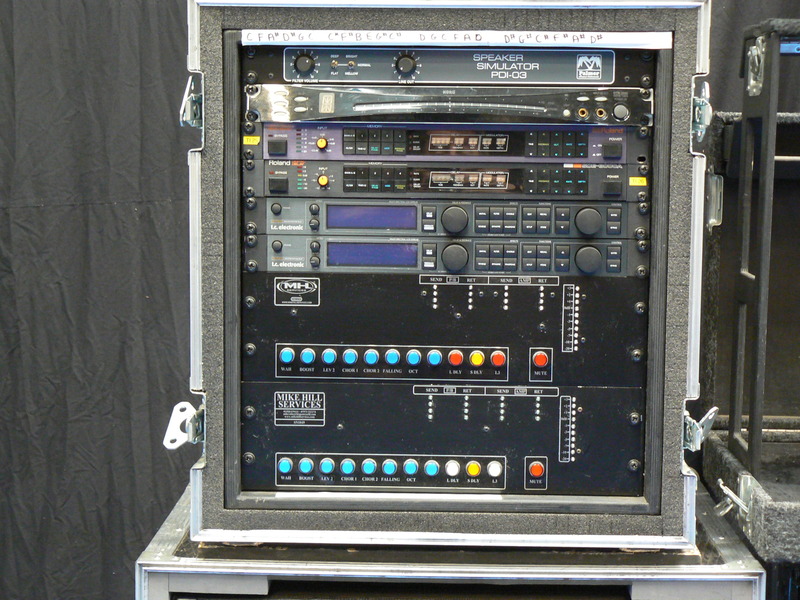 The write-up for Tony’s gear reflects the older Laney GH100TI rig, but has pictures of the Laney TI100 stage rig. Maybe adding a new section for the new 13 tour rig in addition to the older rig would be appropriate. Just wanted to inform everyone at iommi.com that the tuning for tony’s guitars has not been updated! Old boy is not in d tuning anymore it has now been tuned to C flat (you can confirm this with tony himself). There is also no mention of tony’s main guitar for this tour (all red sg which is tuned to d) and for the monkey replica that was made for him by a fan and also used by tony earlier in the tour. I will be updating stuff very soon now, but to address your comments, The Old Boy has now been retired from live work, it is just too valuable to have out on the road with all the freighting etc. However, it has only ever been used in D# with Sabbath and D in Heaven and Hell. Prior to the ’13’ Tour, the C# guitars were always one of the Gibson Custom Shop Iommi Signature models. Now we have the Jaydee models, on the ’13’ tour C, C# and D were Jaydees and D# was either a Gibson as above or the St Moritz Monkey. Hello Mike, Who made the call on retirement of the Old Boy. Was it you and Tony together. Do you mind estimating the value on here. Also, I know one of Tony’s Gibson Custom shop red SG’s was taken at Donnington. I have #114 red. Tony signed this guitar at one of his book signing dates in NJ. I bought it from that owner. If Tony would like to have it I would send it to him. What pedals where in the end board i have a guess but dont know mxr cobon copy,mxr phase90 , boss what?, boss chorus what?,tc electronic vortex flanger and strymon brigader delay. What are the blue ones what models? In the sabbath days, iommi played standard tuning for the first two records, then switched to c# for the rest of ozzy’s career except for technical ecstasy and never say die. The two albums with dio were in d#. After forever is the only song in d tuning that i am aware of. Cheers! On the cabinets it appears that the part of the grill that covers the speakers isn’t the metal with cross cut-outs that’s on the rest of the grill. I’ve seen other pics of the new live rig elsewhere on the web and they show the cross cut-out grill covering the entire face of the cab. Pics of this cab on Laney’s website show the same thing. Did Tony have his cabs modified at some point? Pic. n° 5: why there are some different scale (written by a black pen) on the top of the rack, on a paper film? may be, the set of four different guitar? That’s C Standard, C# Standard, D Standard, and D# Standard tunings, right above the rack tuner for easy reference. If you’re the one tasked with making sure Tony Iommi’s guitars are in tune during a show, you probably wouldn’t want to have to rely on memory for four different tunings, no matter how many thousands of times you’ve done it. I’m guessing it gets pretty hectic backstage, lots to do in very little time and no room for error. i was wondering if you could draw a schematic for the lkiove set-up. For your story woth al the side chains and loops makes it had to imagine how evenrithing words. I would be very glad to know how everything works! What microphones are used in front of the speaker cabinets? At what point in the tour did Tony switch the 100TI heads to 100bl heads? I also heard the g12t75speakers were replaced with G12 Heritage speakers. Black Sabbath is awesome. I wish I had there amplifiers. I would blast music crazy loud!!!! Will this page be updated to include the gear/rig used on The End tour? Along with an update for The End Tour gear used, a line diagram/schematic would be helpful! Thanks!